Looking to spice up your kitchen? Or maybe you’re looking to replace your worn out countertops? Perhaps you’d like to give your kitchen the makeover it deserves? Look no further as we offer the best affordable kitchen countertop replacement service in Singapore. You’ll be hard-pressed if you miss out on meeting our kitchen design experts. So we’d suggest that you get in touch today! From material to style and even colour, you’ll get the best advice for your awesome new countertop from our specialists. Rest assured that you’ll be satisfied with how your brand new countertop will fit not only in your home but to your lifestyle as well. Furthermore, we work with a wide range of materials for kitchen countertops. So you don’t have to worry about whether or not we’re able to satisfy your countertop needs. Perhaps you’re looking for a highly durable material with granite, or maybe you’d prefer the stunning aesthetics that come with quartz. Whatever the case is, we’ve got your back. We’ll definitely ensure that you get the best bang for your buck if you choose us. Our services include kitchen countertop consultation, taking measurements, and the installation and replacement of kitchen countertops. Now, we know that kitchen countertops can be a difficult terrain to manoeuvre. But fret not we’ve got you covered. Here are some of our countertop tips for your kitchen. Like most other material things, wear and tear has an effect on our kitchen. More specifically, most countertops will need to be replaced every 3 to 5 years, depending on the material. A surefire way to know when to go countertop shopping is by observing the surface of your old countertop. Cracks, stains, and scratches are good indicators that a brand-new countertop may be just what you need. Moreover, adding the right countertop to your old kitchen would definitely make the place look new again. For those frugal people, you don’t have to worry. Our services are well worth your investment. As they say, the kitchen is the heart of the home so it would make sense to put in a little bit more moolah to pretty it up, no? Regardless, the cost of installing or replacing your old countertops is ultimately decided by its material. High-quality materials like quartz will cost you more, whereas more common materials will be easier on the wallet. Though with so many different materials from a myriad of brands, finding the right fit for your budget is going to be a breeze. Our free cost estimator is just a click away. What are you waiting for? Get your free quote today! Which material is the best for countertops? There are a lot of materials of varying prices that can be used in your countertops but for simplicity’s sake, we’ll look at the four popular materials from our line up. mostly used in kitchen & vanity. What materials for countertops do you have on-hand? Our elegant and affordable countertops sport a variety of materials such as quartz, granite, solid surface, marble, and so on. What does a porous surface mean? A porous surface is a surface that has empty spaces (pores) in it that allow external matter (water) to pass through it. Do all countertops require maintenance? Typically yes. The difference being some materials such as granite requires regular treatment with a sealer to prevent stains. While other materials may not require much effort. Can our old countertops be repaired? Yes, it’s definitely possible. However, there are times when replacing your old countertops is the better choice. How do you determine the cost of a specific countertop? There are a variety of factors that contribute to our pricing. These include the brand of the material, quantity of material required, the complexity of the job, availability, and so on. We have a whole range of choices for you to pick from. Famous brands that you can find in Singapore include Caesarstone, SileStone, Corian, Bellus, 3S, Tristone, Samsung Staron, Co-Top and more! Yes, we do have instalment plans! Yes, credit cards are definitely accepted. Those are some of the more commonly asked questions we’ve received. If you would like to find out more, head on over to our FAQ page. Interested in replacing your old kitchen countertops? If you want a hassle-free kitchen countertop replacement at an affordable price, our friendly countertop consultants are always ready to talk. 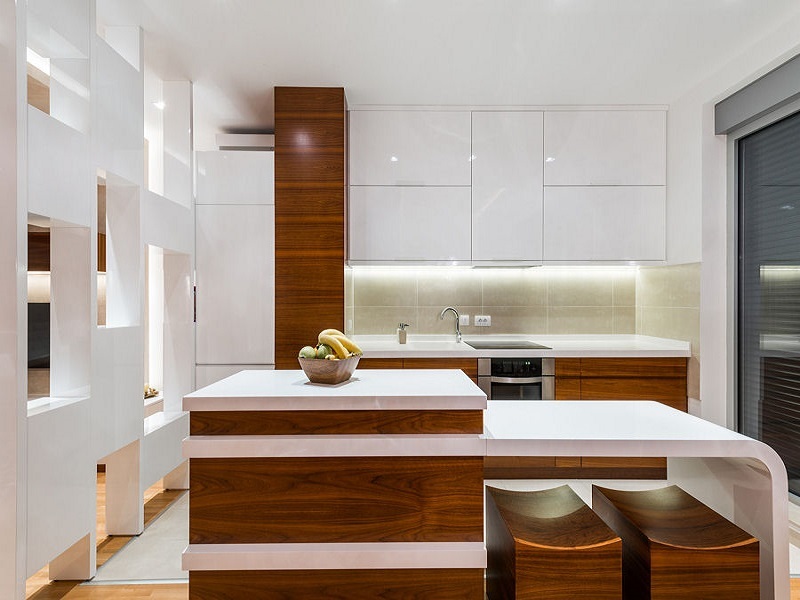 Alternatively, we also offer kitchen replacement and kitchen makeover services.